Before heading out on our current one year of travelling-the-world-trip, we decided we wanted to buy new backpacks for the both of us. On our previous backpacker trips we have been using normal backpacks from two Norwegian brands (Norrøna and Bergans), which we also use when mountain trekking in Norway. They are really comfortable on our backs, especially when carrying a heavy load, but not ideal for backpacking. They can not open in the front, only at the top, making the organization inside a total mess. 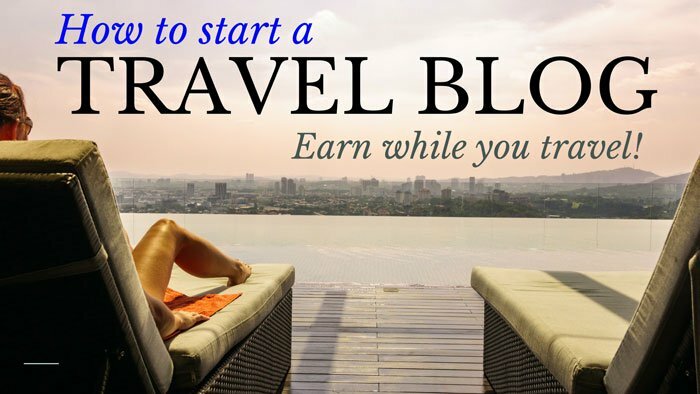 We started surfing internet for backpacks suitable for travelling, reading blogs and reviews. We also visited the travel specialist shop in Norway, Nomaden in Oslo, where we tried on quite a few backpacks from different brands. In the end, we both chose the Osprey Waypoint 85 backpack. This model also comes in a 65 liter size. But considering Maria has a bad habit of over-packing as well as over-shopping along the way, we had to go for the big ones of 85 liters. To be fair the backpack is actually “only” 70 liters, plus the small day-pack which is 15 liters. The backpack has a great design, and we really like the way it is divided into several compartments. It consists of one large main compartment, with two straps inside to keep the content study and in place. The big compartment with two straps inside. 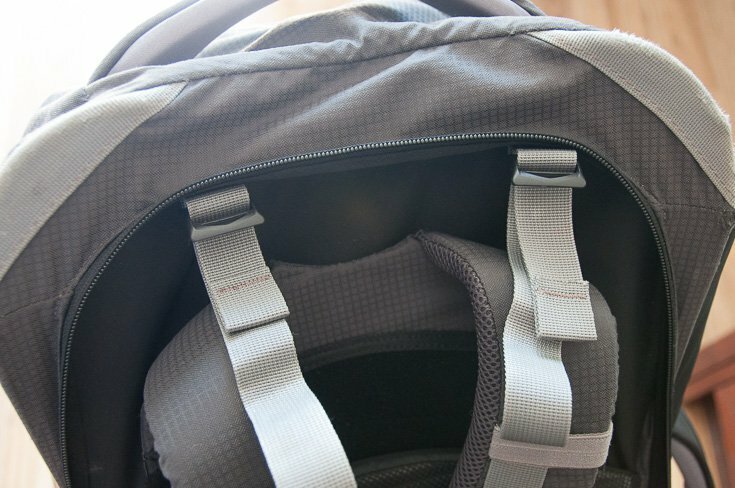 The front of the backpack can be opened completely. 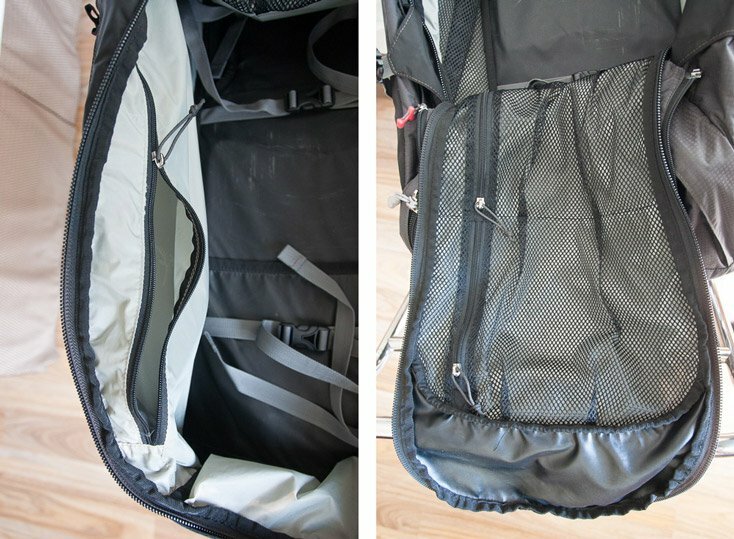 In the bottom there is a smaller compartment, which is only reachable from a zipper in front of the backpack. 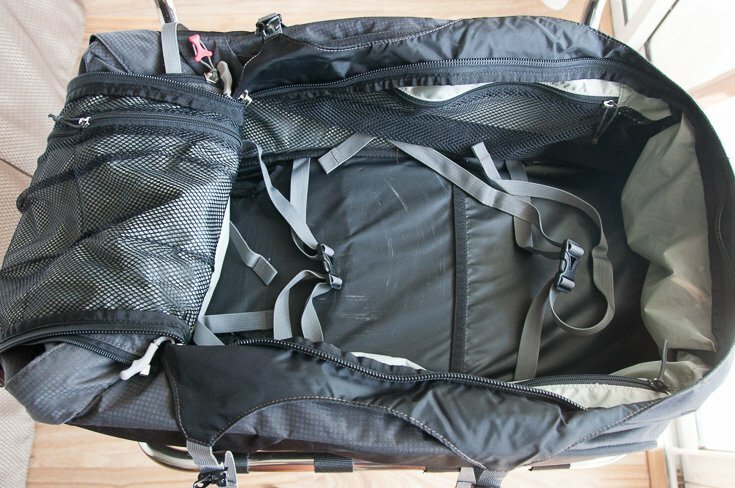 This smaller compartment is completely separated from the big one, which makes it easier to organize the backpack. The small compartment in the bottom. 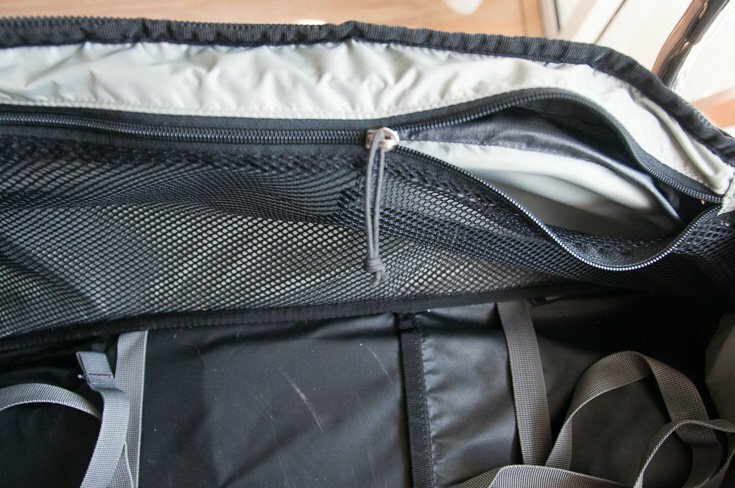 The big compartment has one fairly large side pocket with mesh. Perfect for an umbrella, mosquito net, chargers, books, towels and so on. In the other side of the big compartment there is another large side pocket. The lid has two see-through mesh pockets. This is nice for small light things/ clothes. I have my bikinis in one, and papers, receipts and maps that I want to keep in the other. To the left: Large side pocket. To the right: Two mesh pockets in the lid. On the top of the backpack there is a small pocket, for small things one might need in a hurry, like headlamp, pad locks, rain cover, and so on. One small pocket on the top of the backpack. The best part of the backpack, and the main reason why we chose it, is that it has a big zipper in the front, making the whole front a lid that can be opened completely. That way the backpack becomes like a suitcase when lying open on it’s back, and it is easy to find and organize the stuff inside. It also has a zipper in the side, which one can access the main compartment through. It’s nice with two entrances so one doesn’t have to open the whole front in order to get something out. Another big reason why we chose this model, is that one can cover up the carry straps with an extra lid that is tucked away in a small pocket at the bottom of the backpack. 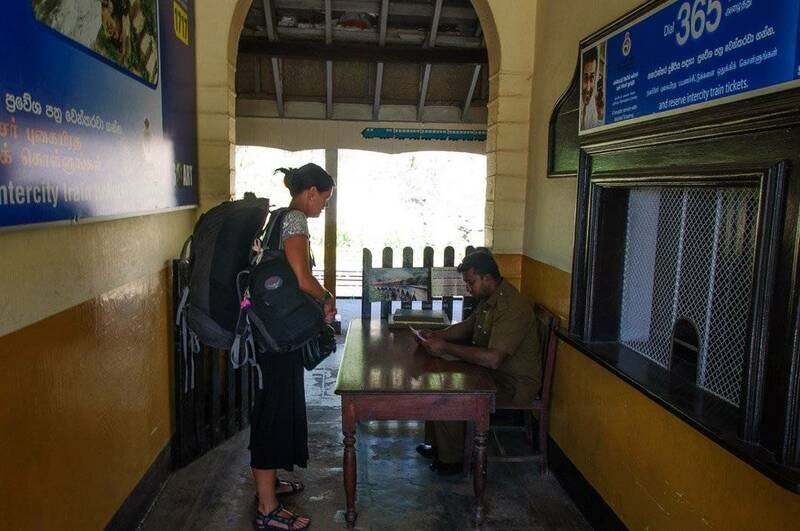 That way one can easily make the backpack into a bag when checking it in at airports, or boats, buses, trains and other places. 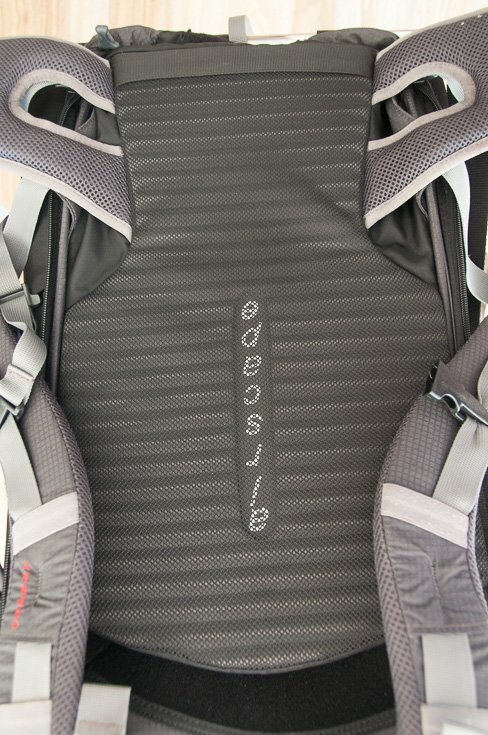 This minimizes the amount of wear and tear on the backpack’s straps during transport. The backpack can easily be made into a bag. The sides of the backpack are stiff making the backpack keep it’s shape even with the lid open. Convenient for when you don’t want to unpack in your hostel/hotel room. You can easily just keep your clothes in it the whole time. 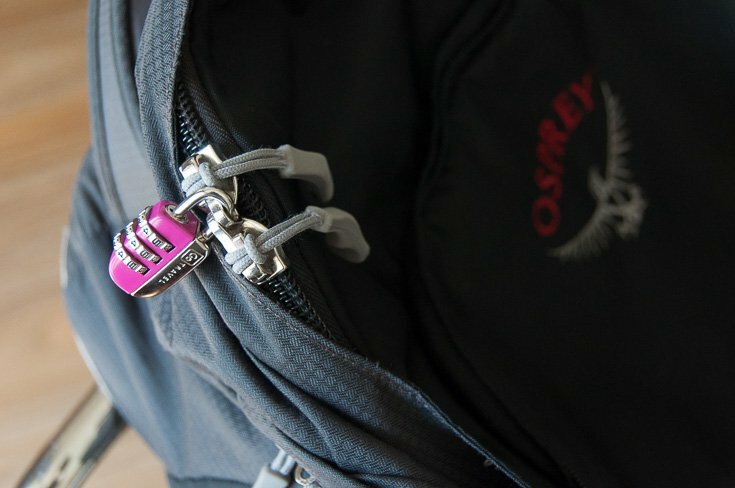 All zippers can be locked with padlocks, which makes it thief-resistant when traveling on buses and trains. We really like the small day-pack which can be attached to the big backpack using a zipper. We use the small backpacks a lot, both as hand-luggage when traveling and as day-packs when sightseeing and going on small hikes. 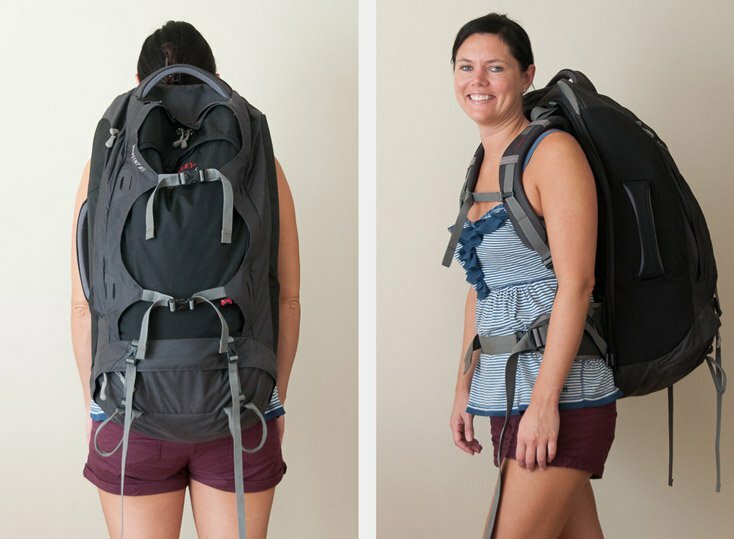 The day-pack can be attached to the big backpack. The day-pack is 15 liter. The day-pack can only be opened in the back, making it thief-proof when walking through crowded areas. The day-pack can only be opened from the back, making it thief-proof. The day-pack also has two small pockets with zippers, one in each side, ideal for water bottles and so. 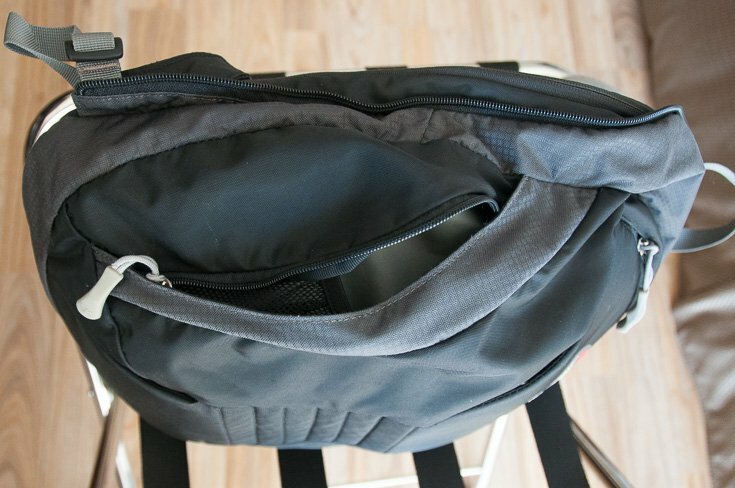 The day-pack has two side pockets. It also has one fairly large pocket on top for small things like tickets, tissues, sunscreen and mosquito repellent. Top pocket on the day-pack. 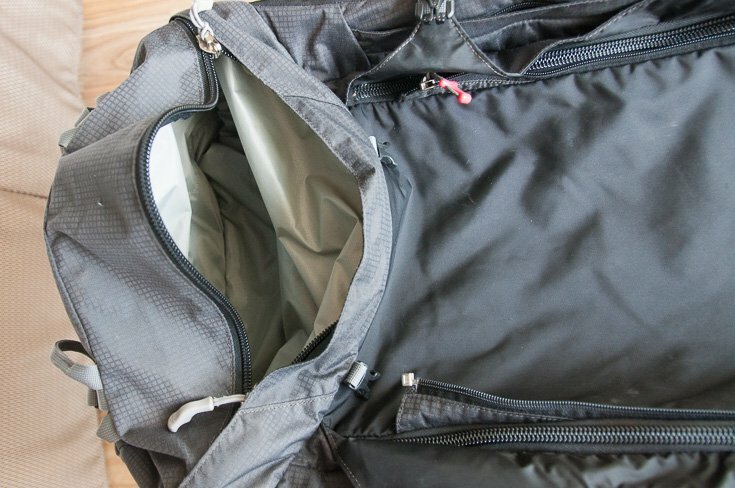 Inside the day-pack is one big compartment, as well as a smaller padded laptop compartment towards the back. 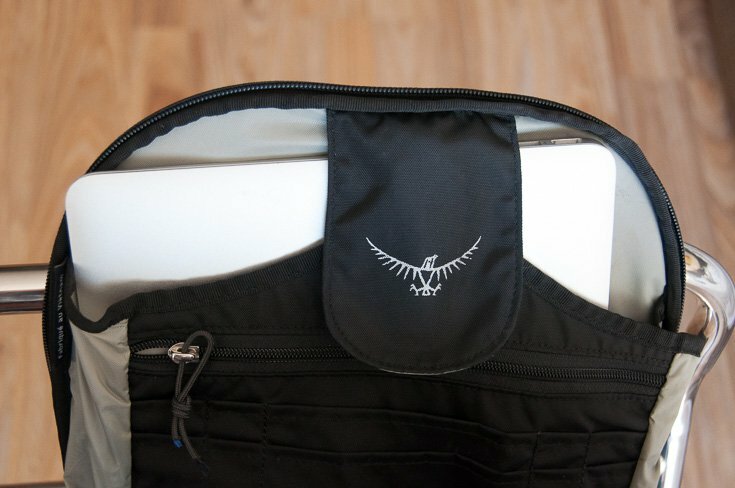 Perfect for safe storage of laptops, Ipads and other electronics when traveling. The big compartment of the day-pack. Laptop compartment in the day-pack. Here are also some small pockets and one bigger with a zipper, convenient for small stuff such as pens, passport and wallet. Several small pockets inside the day-pack. 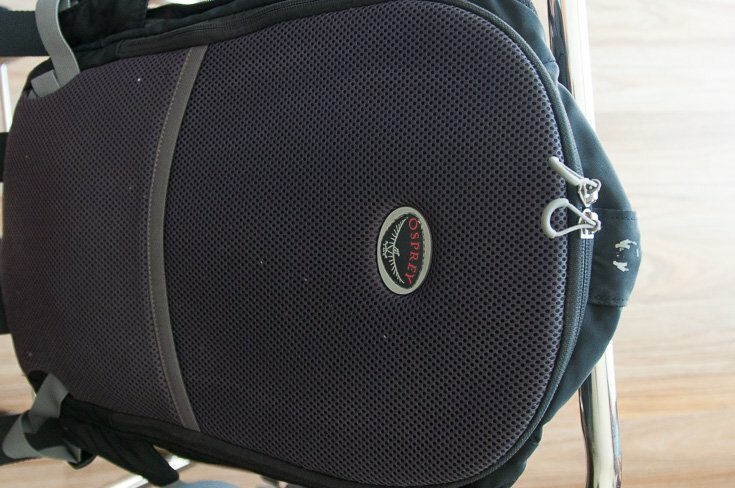 Adjustable back on the big backpack. It comes in two different colors, green and black for women and black and brown for men. Nice to have a choice. It does not come with an in built rain cover. So we had to buy that extra. We paid around 40 US$ for the Large Osprey raincover. Not that much, but still, it all adds up. I wish that it was included, since it is really necessary to have a rain cover on a longer trip. 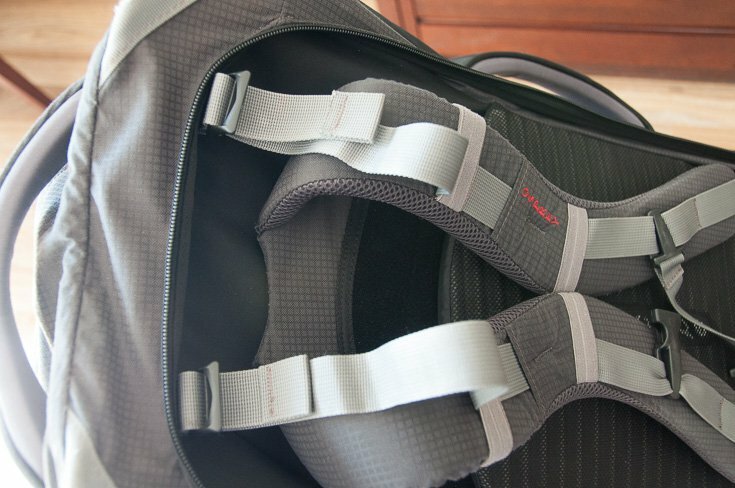 On top of the shoulder straps, there is a strap that tend to slide out when putting on the backpack. 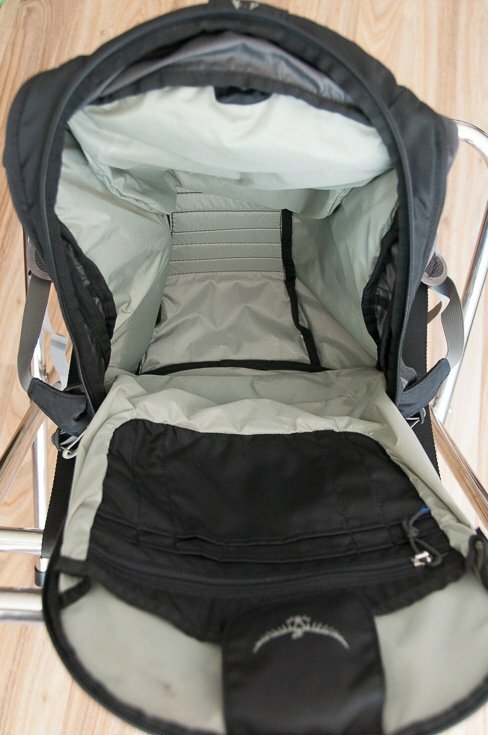 It slides out to it’s maximal length all the time, creating a gap between the back and the backpack. It is easy to tighten it again by just grabbing the end and giving it a pull, but it is really annoying! The shoulder straps keep sliding out from it`s buckle. The day-pack has one weak element, the small rope-thing attached to the zippers used to open and close the day-pack in the back. These have both broken on my day-pack, so I had to buy some new ones. I ended up buying new ones of the brand Chums, at the Travel Shop in Bangkok, at Siam Discovery. That is the only thing that has broken or fallen apart on the backpacks so far. 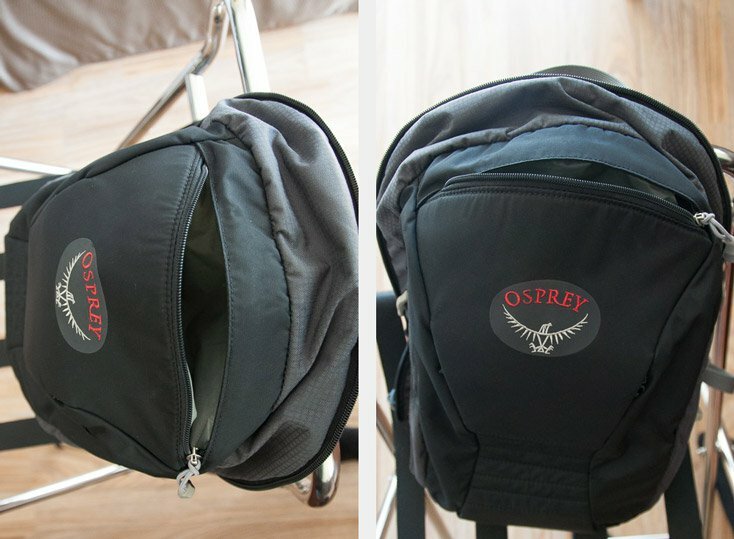 Over all we are very pleased with our Osprey Waypoint 85 backpacks! They have served us well and gotten our things safely around Asia (except from one time when Espen had a cockroach all of a sudden jumping out of his backpack! Nearly gave him a heart attack! But that was not the backpack’s fault….). We particularly like that it is divided into smart compartments, making it easy to organize the content, as well as unpacking and packing quickly. And that it has a big zipper in front, making the whole front to a lid that can be opened completely. Even though the backpack is divided into compartments, it still gets pretty chaotic inside after a while of travels. We chose to buy Eagle Creek packing cubes to get the backpacks more organized. 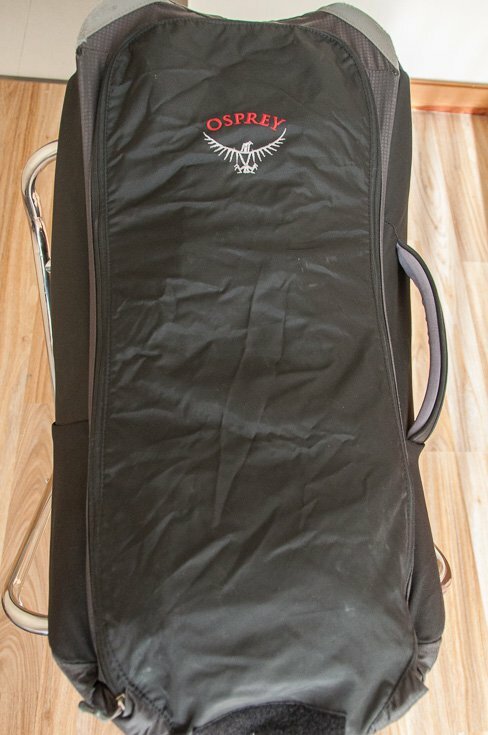 Please read our review of the Eagle Creek Packing System here! 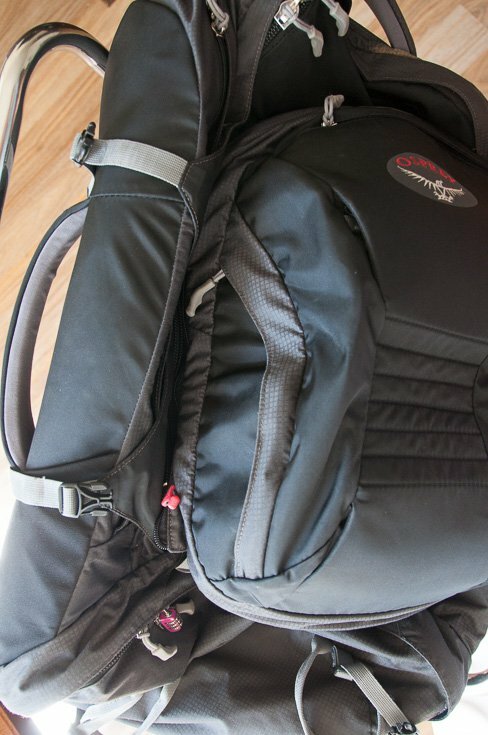 Hope you find our review of the Osprey Waypoint backpack useful. Let us know in the comments below if you have any further questions, and we will be happy to answer them! All of the above links are affiliate links, and we will earn a percentage of the sale if you purchase through them at absolutely no extra cost to you! This helps keep our site running at no extra cost to you — so thanks! 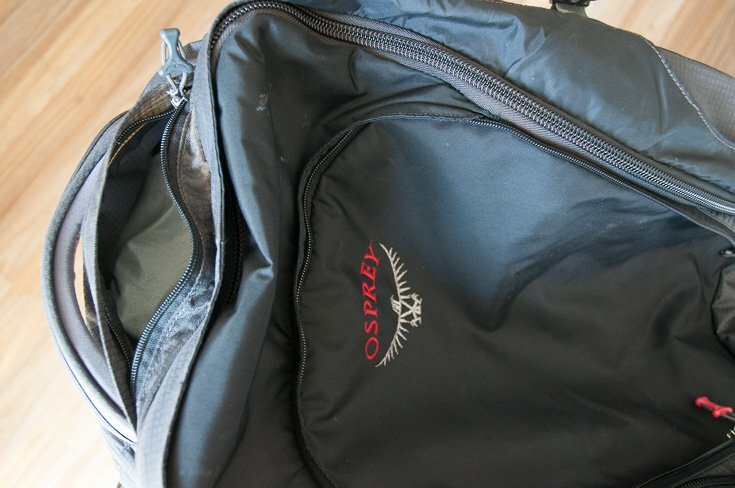 We did pay for the Osprey Waypoint backpacks ourselves, so this is not a sponsored review! Just our honest opinions. Thanks for the very thorough review Maria! I have a small Osprey Daypack that I use for most of my hikes and a larger Camelbak that I use for longer hikes. Haven’t done any backpacking as of yet, so I’m looking forward to seeing where you and Espen travel on your NerdNomad adventures. Keep the photos coming! Thanks for that great comment James! It’s so encouraging to get such nice feedback! I also have a Osprey daypack, Variant 37 l, at home in Northern Norway, that I use a lot for skiing, climbing and hiking trips. Love it! Did not know that Camelbak makes big backpacks, have however one of their small Hydration Backpacks at home, which is great! Great to have you along on our adventures, will def keep the photos coming! 🙂 Happy hiking! My pleasure Maria! I think you are correct about the Camelbak packs, the one I have is a little bigger than the Osprey I have but it’s still just a daypack. I haven’t done any backpacking as of yet, but when I do, I’ll be checking out your Osprey review again for sure. Happy travels and greetings from Southern California! Fantastic review! It was really helpful thanks! I was just wondering if you have done any short hikes with them? I am looking to buy a Waypoint for a trip to India in March, but will be doing a short hike in Nepal (5 days) during that time too. I cant find any reviews that comment on comfort when hiking. Hmm, to be honest, I don`t think the Waypoint will be optimal for a 5 days hike in the mountains of Nepal. I would say that the harness and hip belt is not that comfortable and supportive when the backpack gets heavy and you have to walk with it on your back for several days. The shape of the backpack is also not great for longer hikes, as it is a bit “boxy” and the weight feels wrong on the back when doing long walks. It feels a little unstable on the back when walking in rough terrain. Back home in Norway we have proper hiking backpacks (from Norrona and Arcteryx) about the same size as the Waypointer that we use for hiking. We have however not used our Waypoint backpacks for hiking, only backpacking and carrying the backpacks for shorter distances. But I don`t think it will be comfortable when carrying it over 5 days. I actually always carry my small backpack on my arm or put the shoulder straps on my shoulders so the small backpack is in front of me on my chest. I have actually never zipped it on to my big backpack. One of the reason is probably that it is pretty heavy itself (containing all my electronics), and stuffed, so it will make my big backpack even heavier and bigger. I also use it as a carry-on on planes, buses and trains. Love the small backpack, it is perfect! The grey plastic piece on the zippers came off pretty early on our trip on my backpack too. So I ended up buying new ones from Chums at Amazon: http://nerdnomads.com/chums. They are awesome and very strong, and have not fallen off even after one year of heavy use. Also the corners of my backpack is a bit worn by now. But thanks to the feature of covering up the shoulder straps on the big backpack (making it into a bag), the shoulder straps are not worn at all. I always cover them up when we check in to trains, buses or planes. 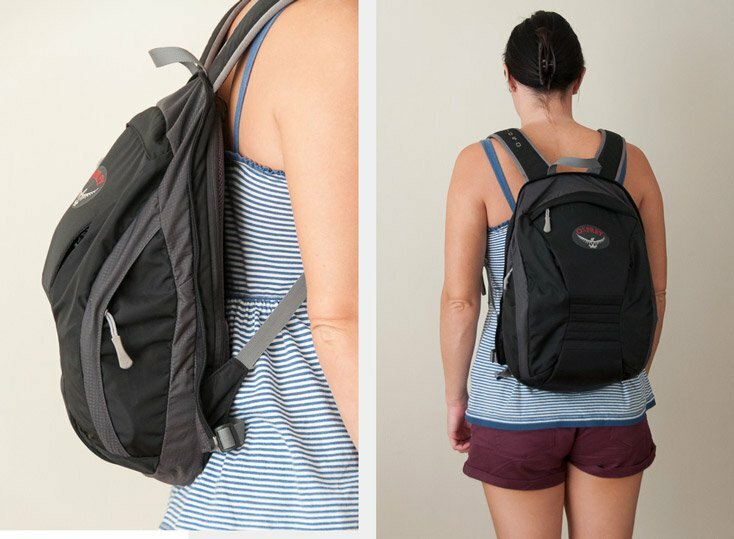 Just met a friend here in Costa Rica who has this, and she loves it (and I also fell in love with the day pack that zips out – seems so perfect). Thanks for this informational and awesome review! Cheers! Thanks for your kind words! Glad to hear that others love this backpack as much as we do! 🙂 The day pack is perfect, I use mine all the time. Thanks for commenting, and happy travels! I have this backpack and also love it! My zipper tags also came off (probably around ~1.5 months of use). I was NOT gentle with my packing, despite all of the space in the 70L bag. Just wanted to let you know that they seem to have a good warranty- I just phoned up Osprey (actually “In Sport Fashions, Inc” in Canada) when I was home and they sent me about 3 dozen zipper tags in the mail within a week. Not so convenient while traveling, but good to know! I’ve heard rumours of a lifetime warranty as well? Hm. Thanks for the tip about getting new zipper tags from Osprey! I will definitely phone them too and get some new ones. Yeah, I`ve heard that Osprey has a lifetime warranty too, which is awesome. Hi Maria, great article. Quick question, can I take the waypoint theas my carry on? 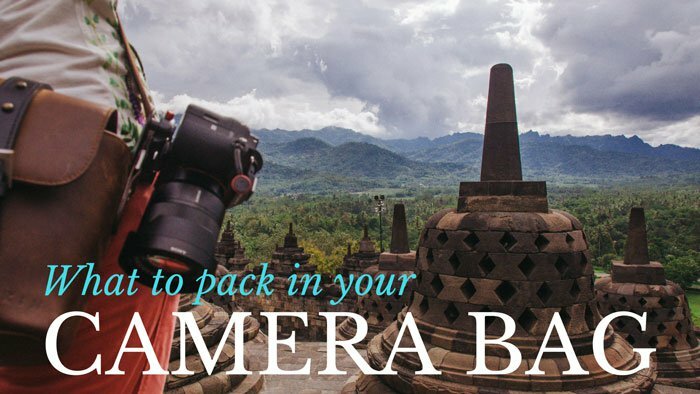 I thought about just taking the 70 L bag only, leaving the daypack at home…thanks! Hmm, unfortunately, I don`t think the 70 L Waypoint will be allowed as hand luggage, I think it is too bit. 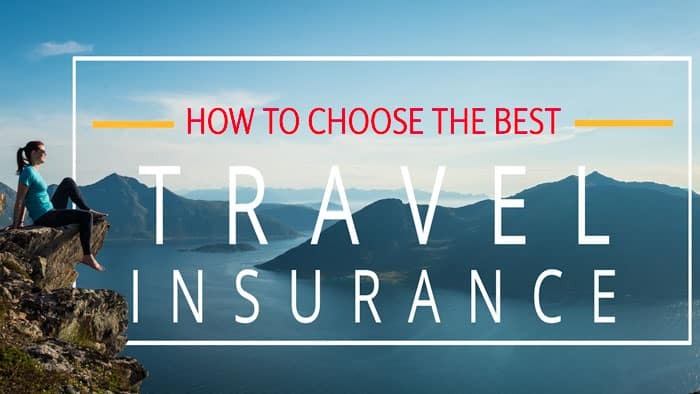 But you should check with the airline that you are traveling with, what limits they have regarding hand luggage size. Cool review. 🙂 I’ve had this exact bag since ’09. It’s gone around the world twice along with many other short trips. It’s still going fine – looks very “well loved”. All the zipper pulls have been replaced, some of them twice, but other than a few frayed corners this thing is still travel-worthy. Personally I never really loved the day-pack. Attached it makes the main bag much less comfortable to carry, and as a stand-alone day pack I never felt it had quite enough room. I kept it around but it’s been in storage since that first trip. 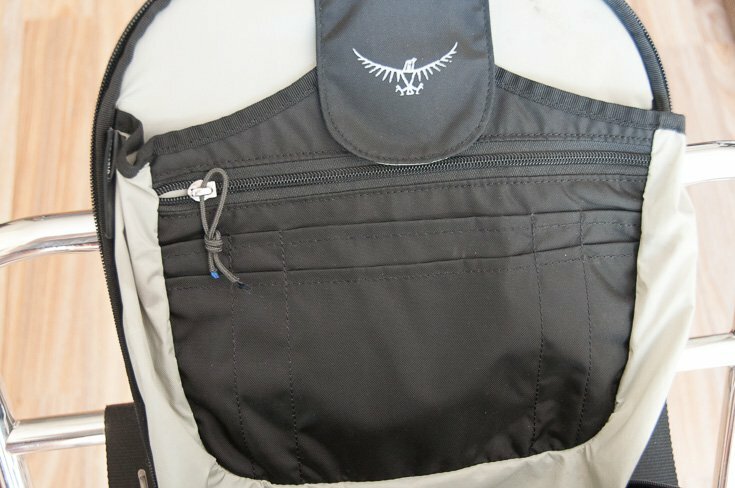 I bought an Osprey Flapjack messenger-style bag that I used instead. With a carabiner clipping to the top-back Waypoint main bag, and compressing the outer straps over it to cradle the flapjack, I could still carry it on the back of the way point just fine. Usually it slung in front of me though. Mostly I just the think the large Waypoint was a lot better without the daypack attached and still had a ton of room. All in all – still love it. Can’t believe it’s still going. Thank you so much! Wow, great to hear that you bought your Osprey Waypoint in 2009 and that you are still using it! We bought ours in 2013, and still love them. Like you, we don`t attach the day-pack to the main bag either, just keep it in the front of us. We are heading out for a new big trip in just a few weeks and will leave the day-pack at home this time. We have, like you, bought new and bigger bags for our day-packs.